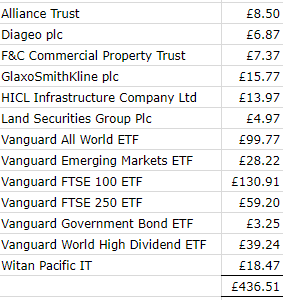 I received £436.51, which means total dividends so far this year now stands at £2,671.47. It’s touch and go whether I will bag enough in the next two months in order to hit my target – I think I need a big increase in December from last year to hit it but we’ll see. All dividends are reinvested, bundled up with whatever extra capital I invest monthly. For those interested, the profit ratio of actual MB (football and horses only), no-lay accas and no-lay EW betting was 33/51/16, very different from the previous two months. 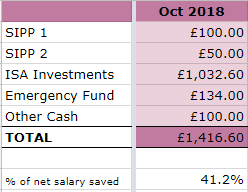 Total MB profits so far this year stand at £3,983, so bar an absolute disaster over the next two months, I have comfortably achieved my goal – yay! It might even be possible to get to £5k but we’ll see what Lady Luck/Variance has in store for me! As mentioned before, the matched betting guide I subscribe to is OddsMonkey*, which is great for beginners and experienced matched bettors alike with quality tools such as the Oddsmatcher, Each Way Matcher, Extra Place Matcher, Dutch Finder, Racing Matcher and Acca Matcher. There are step by step guides and also a friendly forum for you to ask questions and get help on any of the offers. Matched betting isn’t everyone’s cup of tea but you won’t know until you try it! Anyway, check out the free trial* (with no obligations). 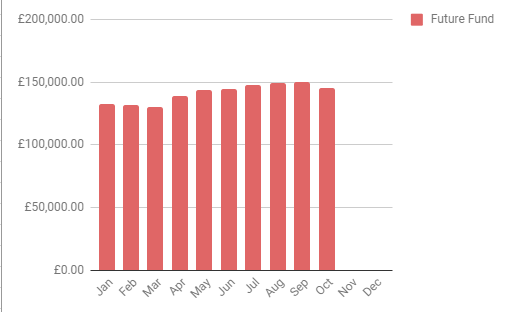 Still quite a bit behind on my main reading goal – it’s looking tough to achieve. I should hit the charity one next month so that will be another goal ticked off the list. Ms ZiYou’s got a new series on her blog called ‘Let’s meet UK Personal Finance Bloggers‘ – here are my answers to her questionnaire in case you missed them, plus you’ll find some other interviews there too. Also, you might be interested in some FIRE podcasts over at the UK FI Pod, again run by Ms ZiYou (she’s been busy lately!). Anyway, I tried to resist turning on the heating but after a week of scraping ice off my windscreen, I couldn’t hold out any longer! Winter’s not my favourite time of year. Hope you all had a great October! This entry was posted in Books, Dividend Investing, Earnings, Expenses, Investment Trusts, matched betting, Portfolio, Savings by weenie. Bookmark the permalink. It’s easier to do that now but I think if I was relying on my investment income, it would have been a different story! Great to hear that it wasn’t too bad with your investments either! Still a very good savings rate >40%! Whilst not your target it certainly helps in preparing for the future. Well done on resisting peeking at the turmoil in the market – I did and at times it wasnt very pretty, but like you I just held on and waited – fingers crossed you hit the dividend goal, it looks VERY close indeed! In my early days of investing, I use to check my balances every day – had I still been doing that, I think I would have been a nervous wreck and it was only a small correction! Yes, things will be tight on the dividends, even after November’s but fingers crossed! Have you had a correction this big before since you started saving? Imagine if it was a 50% drop! Frightening 😀 as I’m only a year into aggressively saving, it’s not hit me that badly. Love your pumpkins! Another awesome meal to try with them is pumpkin mac and cheese, it’s soo good! Yes, stocks on sale but I’m just going to continue investing as normal and not ‘shop for bargains’. I think this is the biggest corrections I’ve experienced so far since I started investing and I feel ok about it – not checking my balances every day probably helped! A 50% drop would be terrible but rather now than later! Yes, I plan on buying some more pumpkin as it’s a good ‘winter’ food! Not a fan of mac and cheese to be honest but I will look for other recipes! I love your pumpkins Weenie – they are cool. Did they take you a long time to carve? And your graphs is the perfect demonstration that although market have gone down, it’s not that bad in the scheme of thing – a good perspective there. As I always say, you are more than welcome to come on the podcast anytime :). Thanks Ms ZiYou – I think from start to finish, the pumpkins took a couple of hours to do each. And yes, I thought the graph would show the true picture, that it wasn’t as disastrous as made out in the press and media. Those pumpkins look awesome! Got me tempted to try myself. When you do you no-lay accas, how do you choose them? Just, any that are boosted, or do you make your own? Cheers Dr FIRE – it was really enjoyable carving them. I might try something more intricate next time. With the no-lay accas, I never make my own, I use Oddsmonkey’s Acca Builder No Lay tool and only the offers that give a free bet if one leg loses. Occasionally, if I am able to, if 4 legs have won, I may lay the last leg to log in a bit of extra profit. Stakes are max £10 at the moment but I may start increasing the stakes. Great to see you’re riding out the storm! I must admit I also avoided looking at the numbers too often. It’s great when everything goes up, but during times with high volatility it’s less fun. I simply had to remind myself I am not a day-trader and have a risk tolerance to get through this without losing sleep. Thanks Marc and yes, I wouldn’t like to be a day trader, I couldn’t cope, although I’m sure there will be some making a killing somewhere! I’ll let them worry about the day to day stuff while I (and you) look to long game! no time for trick or treaters? good job my six little horrors aren’t knocking on your door! I usually make a point of going home late so the little horrors have gone to bed! Or hide in my kitchen, haha! And I think it was Tim Hale who wrote in Smarter Investing that one should check and rebalance one’s portfolio just once a year. I’m not quite that zen, but a couple of decades of long-term-buy-and-hold investing have taught me a degree of tranquility, after all we had a similar correction in January and the world didn’t end…. Indeed we seem to have regained a lot of ground just this week. – Have you considered doing surveys as another, albeit small, income stream? I’m signed up with Populous, YouGov and MySurvey, most surveys take 10-20 minutes and there are enough to generate maybe £30/week if you have some spare time and internet. 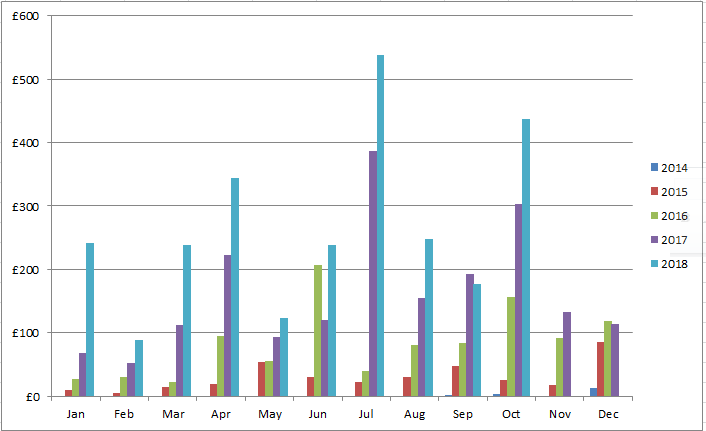 – Regarding the heating, I switched from E.On to Bulb energy earlier this year, cutting my costs by about £70 a month. I also recommended some friends and family who switched, netting me £50 a time in referral fees (and I don’t have a blog ;-). No connection with the company, just a satisfied customer. I’d forgotten about the correction we had in January, shows how much attention I paid to it! And you’re right, even in just this week, the recovery appears to have started so I’ll see how things look at the end of November. I used to do online surveys back when it was quite easy to get £2 to £3 a survey. I stopped doing them when I was filling them in only to find that I didn’t ‘qualify’ so would get nothing for my time. I have got a YouGov account, think I was close the £50 threshold payout so might check that one out again. If anything, to get more cash, I would probably ramp up my matched betting as I don’t spend that much time on it – I could probably dedicate more hours at the weekend if I wanted to . I’m on a fixed agreement with my heating so the cheapest I can get right now – when it runs out next year, I will switch or get another fixed plan. I collect Nectar points the via my Expedia flights so no idea how many I have and I don’t generally shop at Sainsburys. But I could – thanks for the tip. Interesting – I have some Lifestrategy funds (both 60% and 80%) – never thought to really look at them to see how they are affected. Right now, my figures don’t look real to me – I don’t think they will become real until when I realise that they will be pretty much my only source of income! Your savings rate is still VERY respectable so you’re winning there. Must admit I haven’t checked our investments, precisely because I don’t want to see a reduction and I know logically it means nothing at this point in time. No point looking at a negative if I don’t need to! Trick or treaters only knock round our way if you have a pumpkin or other Halloween decorations out front. So we haven’t had any for a couple of years now. Still have to buy a pack of sweets just in case. More sweeties for me! If I didn’t update my figures every month on the blog, I’d be like you, not check them so often which is very different from when I first started investing and I was checking every day! I think the kids here try their chances if they see lights on in the house whether there are decorations out front or not! I have always thought of £150,000 (your target for this year) as a key savings milestone. £150,000 at the 4% rule means six grand a year or £500 per month. Beyond that every £75,000 will be material step forward in term of quality of life in FI as that’s another £250 a month. What my number is I don’t know yet…but one step at a time! £150k is a key milestone, I certainly never thought I’d be anywhere near this a few years ago! However, I won’t be following the 4% rule or any other percentage rule – I don’t intend to preserve all my capital, my intention is to slowly deplete it (though hopefully not to nothing) until I can draw down on the state pension and my DB pension. I’m hoping that the capital which doesn’t get depleted will be able to generate dividend income of c£300, which would cover my bare bones costs, eg utility bills etc. I do have a number but it keeps changing, depending on whether I want a Lean FIRE or a normal FIRE – need to do more spreadsheet work on this! Just came by your site, very nice and clean blog and nice content. Thumbs up for a good work. Thanks for the kind words and thanks for stopping by! Haha, Berry – thanks! I do care, just keeping calm! I don’t think the storm is over just yet recovery seems to be a bit slow. 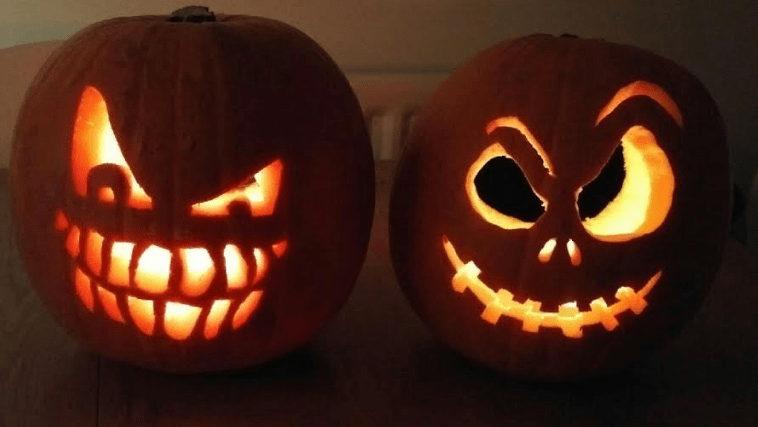 Haha great minds think alike with the scary pumpkin pics on our monthly updates (although I must confess I didn’t even make mine though, they were from my niece and nephew!). I will trust in “the system” and give myself up fully to lady luck!! theFIREstarter recently posted…My 5 years are up! How did I do? Haha, yeah, can’t go wrong with pumpkin pics! Great efforts by your niece and nephew! I went back on my figures and my pot was most affected by this correction percentage-wise, but perhaps it wasn’t the biggest correction – those other dips have been forgotten anyway so I guess I can just move on! I know, nightmare if you’re still checking daily! As seems to be more and more the case I’m horribly behind on my FIRE reading! Oh well, better late than never eh? Thanks for the heads up, Corinna – I’ll have a look at Prolific some time and see whether it’s something I want to try out. I need to do a proper deep analysis of my numbers – I think I’ve only really scraped the surface of my plan, a bit dangerous but let’s see how far off I am when I come to look at them properly. I agree, there are more market crashes on the horizon – good to buying cheap, just doesn’t feel very good though!